Inspired by Albert Einstein's theory of relativity and Bertrand Russell and David Hilbert's pursuit of the fundamental rules of mathematics, some of the most brilliant minds of the generation came together in post-World War I Vienna to present the latest theories in mathematics, science, and philosophy and to build a strong foundation for scientific investigation. Composed of such luminaries as Kurt Gödel and Rudolf Carnap, and stimulated by the works of Ludwig Wittgenstein and Karl Popper, the Vienna Circle left an indelible mark on science. 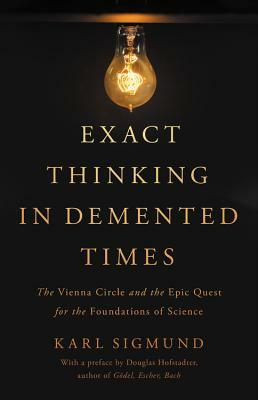 Exact Thinking in Demented Times tells the often outrageous, sometimes tragic, and never boring stories of the men who transformed scientific thought. A revealing work of history, this landmark book pays tribute to those who dared to reinvent knowledge from the ground up. Karl Sigmund is a professor of mathematics at the University of Vienna. One of the pioneers of evolutionary game theory, he lives in Vienna. "Delightful... [Sigmund] has produced a stimulating account of the Circle, not only stating with clarity its ideas but also giving colorful portraits of and personal stories about its members." "There is no doubt that the Vienna Circle was an assemblage of some of the most impressive human beings who have ever walked the planet, and Karl Sigmund's book tells its story, and their stories, in a gripping and eloquent fashion." "Exact Thinking in Demented Times is filled with vivid and fascinating stories of intellectual genius flourishing in the midst of political chaos. Karl Sigmund succeeds in bringing the amazing individuals of the Vienna Circle to life. Highly recommended!" "Karl Sigmund's rich account of the Vienna Circle teems with insights into the thinking its leading lights, which included some of the most important philosophers and scientists of the 1920s and 30s. A superb book, so replete with inter-disciplinary delights that it will make its readers feel like polymaths."